LONDON, Apr 30, 2018 - (ACN Newswire) - Radio and digital audio advertising is the focus of WARC's latest monthly Global Ad Trends report, digesting up-to-date insights and evidenced thinking from the worldwide advertising industry. Following an analysis by WARC, the international authority on advertising and media effectiveness, of its data for the 96 markets included in its Adspend Database, radio advertising spend was found to have amounted to $32bn worldwide in 2017, and is expected to rise by 1.3% this year. On average, radio reaches 75% of households every week across WARC's 12 key markets - Australia, Brazil, Canada, China, France, Germany, India, Italy, Japan, Russia, United Kingdom and United States. Data show that reach is highest in China at 98% or 457.5m homes in 2017. While the equivalent share drops to 77% in the US, the 97.2m households reached is the second-highest total among the measured markets. Data show that while broadcast radio's share of global display advertising spend has decreased by 1.6 percentage points (pp) to 7.2% over the decade to 2017, the medium has gained share of display spend in the majority of key markets since 2008 - most notably in China, the world's second-largest radio market with spend of $6.5bn. This equated to a 6.4% share of all Chinese display spend last year, up 1.2pp since 2008. Radio's share was also up in India (+0.6pp), Germany (+0.5pp), Australia (+0.5pp), Canada (+0.5pp), Italy (+0.1pp) and France (+0.1pp) over the period. Much of radio's global share has been eroded by a dip of 4.0 percentage points in the US, the world's largest radio market at $13.6bn in 2017 (44.1% of all radio spend worldwide). With the US removed, radio's share of display adspend has grown globally by 1.0pp over the last ten years. 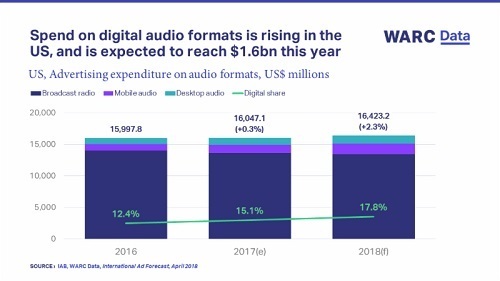 While spend on broadcast radio has fallen in the US each year since 2012, US advertisers are investing more heavily in digital audio formats, particularly on streaming platforms such as Spotify. 39 million American adults now own a smart speaker, and two in five (39%) are using it at the expense of traditional AM/FM radio. However, 71% of owners say they are listening to more audio since purchasing a smart speaker. While podcast advertising is nascent, data show that the format outperformed pre-roll video in driving purchase intent in 57% of cases. Almost four in five (78%) US consumers said that they did not mind the ads or sponsorship messages because they knew they were a means of supporting the podcast. This suggests that most consumers understand the value exchange of podcast advertising. Summing up, James McDonald, Data Editor, WARC, says: "Broadcast radio continues to be a staple for advertisers, and its share of display investment has grown in the majority of key markets, most notably China, where reach is high and CPMs are low compared to other media. "In the US, advertisers are investing more in digital audio, lured by the format's targeting capabilities on platforms such as Spotify. Podcast sponsorship also presents an opportunity, as consumers seem willing to tolerate advertising in exchange for supporting the content they love." Aimed at media and brand owners, market analysts, media, advertising and research agencies as well as academics, WARC Data provides current advertising and media information, hard facts and figures - essential market intelligence for ad industry related business, strategy and planning required in any decision making process.